Small projectors known as pico projectors have been around for awhile. In their original form they attached to computers, phones, cameras, or anything with a video output and projected the content of the connected device onto any available surface. The problem, of course, was the nasty cables that you had to pack around, which not only diminished the portability, but made for a messy and sometimes unpredictable setup. But this was never the mission of the pico projector. From the beginning it was intended to be an embedded technology for mobile electronics. In time it will be as commonplace as a cell phone camera. 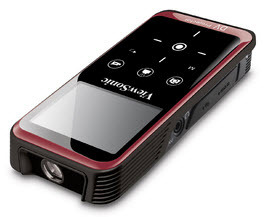 The ViewSonic DVP5 camcorder, with a list price $399.99 and a street price under $300, is among the early products to market with an integrated digital video projector that records videos or photos and has a user friendly interface. All the controls for the camera, camcorder, and projector are touch sensitive buttons on the face of the unit. The touch sensitivity is even adjustable. The size of an iPhone 4 & twice as thick. For those of you who like to remotely control your devices, ViewSonic does not disappoint. Included with the ViewSonic DVP5 is a mini remote control that lets you control all the functionality of the device remotely with the exception of activating the built-in projector. Once manually activated, all content delivered to the projector can be controlled by the remote control. Snapping photos and videos are done with the touch of a button. The resulting images can then be viewed directly on the DVP5's built-in 2.4" display or projected onto any surface using its integrated projector. When projecting, the darker the room and the whiter the surface, the better the image quality will be. The ViewSonic DVP5 pico projector delivers 15 lumens of light output using an LED light source, which unlike many projector lamps, will outlive the useful life of almost any product. Now if you are accustomed to using a large business or home theater projector that generates thousands of lumens of output, you might scoff at a mere 15 lumen projector, but hold your judgment - you'll be amazed at what you can get with 15 lumens. surface. Camera & LED flash on the back for taking photos & videos. The throw range of the ViewSonic DVP5 is 7½ inches (19 cm) to just over 6 feet 9 inches (206 cm). This will generate an image from 6 inches (15 cm) to 65 inches (165.1 cm) in diagonal. I pulled up the DVP5 in the Calculator Pro and plugged in the min and max throw distance to see what kind of image size and brightness we could expect from this little giant. At the short throw limit of 7½ inches you get a 6" diagonal image with a staggering 128 foot-Lamberts. At a long throw of 6 feet 9 inches you get an amazingly good image, but you're down to 1 foot-Lambert! We projected onto a light colored wall using both a dark room and a room with ambient light and got an image that was better than we expected. You can, of course, enlarge the image beyond the stated maximum; however, the image will begin to soften and lose focus as you exceed the manual focal range of the device. To help put the relative brightness of the DVP5 into perspective, consider that your traditional movie theater when properly calibrated will deliver 16 foot-Lamberts of image brightness. projector, and AV, USB & HDMI side connectors. So how does the 15 lumen ViewSonic DVP5 camcorder/projector compare to your traditional movie theater? Well assuming your screen is of the same quality as the movie theater, the 15 lumens from our DVP5 will reach 16 foot-Lamberts when it is 15 inches from the wall projecting a 12 inch diagonal image, which means that from a brightness perspective, it's as good as your movie theater, albeit a much smaller image. However, if you don't use a screen, the performance will be less than theater quality. As you would expect, image quality varies depending on the surface you use for projection, but I was surprised at how well it did with a wide range of surfaces. For a serious test, I set the ViewSonic DVP5 up against a home theater system and did a side-by-side test. Here's the setup. I projected a 94" diagonal 720P image using a home theater projector connected to a Dish Network receiver. I connected the DVP5 to the Dish Network receiver using the Audio Video RCA cable that came with the DVP5. I then cast my shadow over a corner of the screen while holding the DVP5 about 2 feet from the screen giving me a 17 inch diagonal image. Now I expected a radically different result between the two images when I lit them up. To my surprise, the DVP5 was showing more detail, but needed some tuning, so I increased the brightness and contrast by 1 and saturation by 2 and got an excellent picture. It was really quite impressive when you consider the inherent limitations of a device as small as the DVP5. So what about taking snapshots and video? Choose camera or video, point and shoot. It's that simple. Like most cell phones, the camera and flash are on the back of the DVP5. When you're not taking pictures, the LED serves as a flashlight, which is handy in a dark room. videos. LED also serves as a flashlight. Now perhaps your need is not entertainment, but rather a presentation to a few people. To have a good presentation you'll need a projection surface that renders a balanced image and preferably a room where you can manage ambient room light. Play with it at home and you'll quickly learn the do's and don'ts. In terms of image size, I'd start with something easy like an 8 ½ x 11 inch sheet of paper and move up or down in size as room conditions allow. You might also consider using a mobile mini projection screen such as one made by Optoma and a mini tripod that can free up your hands. It's really quite incredible when you think about it. 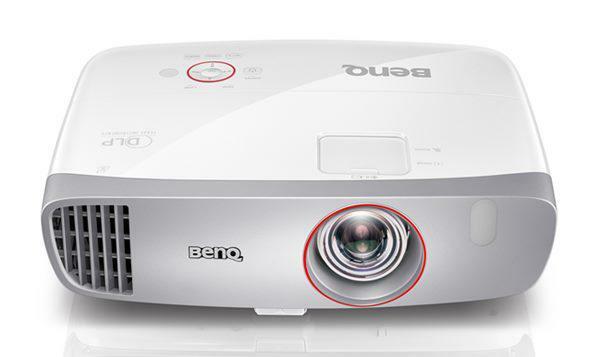 You have a home theater or business presentation in your pocket. Admittedly it's for a small audience, but it has a cool factor. You can use a tee-shirt, a piece of paper, a wall, a floor, or a mini screen to view your pictures or data. As to the size of the ViewSonic DVP5, it is about twice the thickness of an iPhone 4 and very nearly the same surface area with a built-in 12MB memory card and a Micro SD slot that lets you add up to an additional 32GB. That's gigabytes versus megabytes. The DVP5 Camcorder does a nice job of giving you a very crisp image within the throw limits of the unit. While you can move beyond the upper limit simply by moving further away from your screen, quality will diminish as you lose focus and the image will dim as you spread its light output over a larger area. The only complaint I had with the DVP5, and this may have been unique to the sample I received, is that there was a slight reflection around the lens that casted a very faint light to the left of the projected image. There was also an occasional line of visual noise that appeared above the image. When properly adjusted, the ViewSonic DVP5 will deliver a surprisingly good image considering the inherent limitations of a device this small. You can project onto any surface, but the color and type of surface you choose will determine image quality. 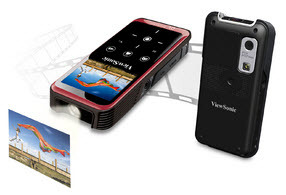 The ViewSonic DVP5 CamCorder is intuitive and easy to use and allows you to shoot both photos and videos and play them back on the projector or the LCD display. Plan on buying an additional memory card as the integrated 12MB card will handle only a few photos or one very short video. As with all projectors, image quality is very much related to resolution, image size, projection surface, and ambient room light, but forget that. The joy is putting up a slide show or a video on the floor of a restaurant, the ceiling of a car, the back of an airplane seat, or on the shirt of the guy in front of you. Rest assured that your kids will be projecting videos under the sheets. What a kick! PS: While a shock test was not intended to be part of this review, let it be known that we dropped the DVP5 on a carpet and it didn't seem to care. This is a test of my character. Can I muster enough fortitude to not buy this thing? I have been wracking my brain to come up with a legitimate use for it. No luck. But it's so damn cool I'll probably break down and buy it. There should be a twelve step program for people like me who are compelled to buy gadgets. Looks like a cool technology overall.